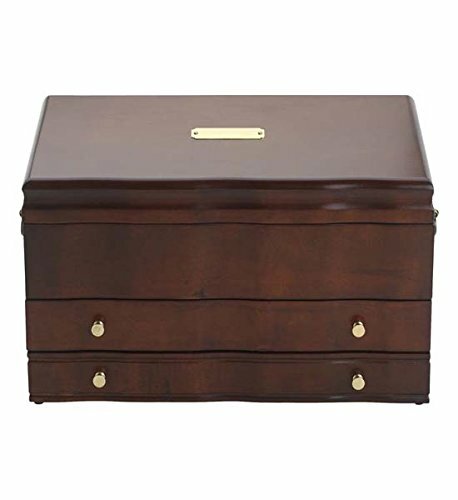 The reed & barton Victoria jewelry chest has a place for everything, and everything in its place this fine-looking, handcrafted chest can accommodate the most expansive collection. The lid with pendant hooks and elasticized pouch opens to reveal a cantilevered tray. The well has several compartments, and there are two drawers for earrings, bracelets, and more. All are lined in "dior" red nylon velvet. Solid-brass drawer pulls and engravable nameplate; brass-finished side handles and cantilevers. Mahogany finish. 15-Inch by 9-1/2-Inch by 8-Inch high.